Jennifer McQuiston, Jonathan Towner and Brian Amman approach Bat Cave in Queen Elizabeth National Park on Aug. 25. Photo: Bonnie Jo Mount/The Washington Post via Getty Images. Scientists hunting for the animal sources for deadly hemorrhagic fevers, such as the Ebola and Marburg viruses, have made the first discovery of a Marburg reservoir in West Africa, the Centers for Disease Control and Prevention announced Thursday. 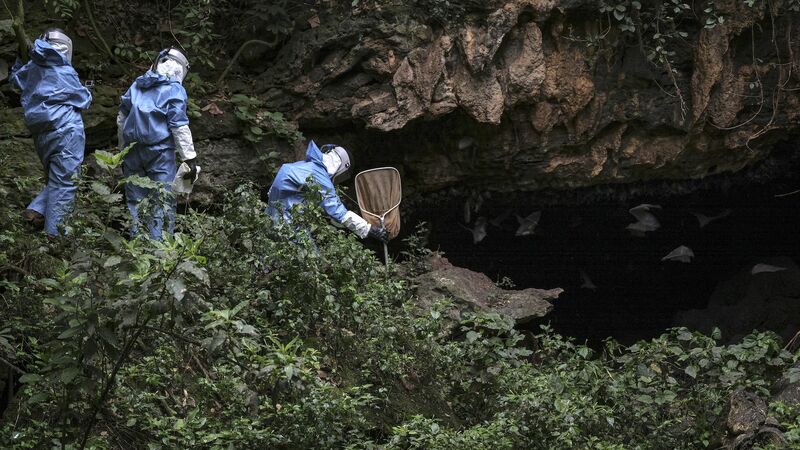 Why it matters: After the deadly West Africa outbreak of the Ebola virus in 2014–2016, scientists have been seeking more information about how animals, like the Egyptian fruit bats in Sierra Leone now found to be carrying Marburg, transmit the disease to humans. This discovery in West Africa means there's a greater risk there for human infection. Zoonotic viruses can jump from animals to people. The animals are carriers of the disease but do not suffer effects from the infection. As human populations grow and settlements expand into new, once-forested lands, it is expected that humans are going to encounter more zoonotic diseases in the coming decades. The term "reservoir" refers to animals where a virus can survive without sickening its host. Background: In the wake of the 2014–2016 Ebola outbreak, 2 groups of scientists went looking for hemorrhagic disease reservoirs in West Africa. One led by the CDC and Njala University, and another by the UC Davis and the University of Makeni. What the CDC team found: 5 Egyptian rousette fruit bats — which can pass the virus to people through their saliva, feces or urine — tested positive for active Marburg virus infection. The bad news: These bats were caught separately in 3 health districts, meaning the risk is over a wide area. The semi-good news: No one in Sierra Leone has contracted the deadly illness, despite the fact there are indications the virus is not new to the area (due to finding multiple genetic strains). “We have known for a long time that rousette bats, which carry Marburg virus in other parts of Africa, also live in West Africa. So it’s not surprising that we’d find the virus in bats there,” CDC ecologist and team leader Jonathan Towner said in a press release. Threat level: The Marburg virus is in the same filovirus family as Ebola, and also causes fever, headache, nausea and vomiting. Its symptoms can proceed to hemorrhaging and multi-organ failure. The largest and deadliest Marburg virus outbreak occurred in Angola in 2005, killing 90% of the 252 people it infected. In a worrisome finding, the scientists working in Sierra Leone detected the Angolan strain of the virus in some of the bats there. But, but, but: The colonies of Egyptian fruit bats tend to be far larger in sub-Saharan Africa, where Marburg virus has infected people, with more than 100,000 animals per colony, the CDC said. The colonies in West Africa are far smaller, which could mitigate some of the risk to people there.